Greetings lenders! My name is Neil DiMuccio, and I am a Client Relationship Manager with Zidisha in Kenya. I am currently visiting borrowers to learn more about them and support them with their Zidisha loans. It is my hope that this work will build bridges to better connection and understanding, and that Zidisha and its borrowers will increasingly grow, communicate, and support each other. I recently had the opportunity to meet and work extensively with Robert Ndungu, who also goes by Robert Njoroge. To be perfectly honest, I was thrilled to meet this man, because he was the first person I had lent to using the Zidisha platform last year! I decided to lend to Robert because he was offering a high interest rate (at the time), because he had numerous sources of income, and because he seemed to be something of a pillar in his community. My visits to Karunga have affirmed these thoughts – Robert is a well-known, hard-working, and productive member of his community! I made several visits to Karunga, a small agricultural community some 12 kilometers North and East of Nakuru near Bahati. This town is a hotspot for Zidisha borrowers, with some 30-40 persons having Zidisha loans in the area, due in part to the work of gentlemen such as Robert, who is a Zidisha Community Organizer for Karunga. Luckily, the ride to Karunga is gorgeous. Imagine this: getting on back of a motorbike, and zipping along a bumpy and rutted dirt road, seeing fields of wheat, corn, and sunflower underneath a canopy of trees. All this while cows and goats graze idyllically, and locals smile and wave to you. Living and working in Kenya may not always be easy or comfortable, but it certainly has its pleasures! 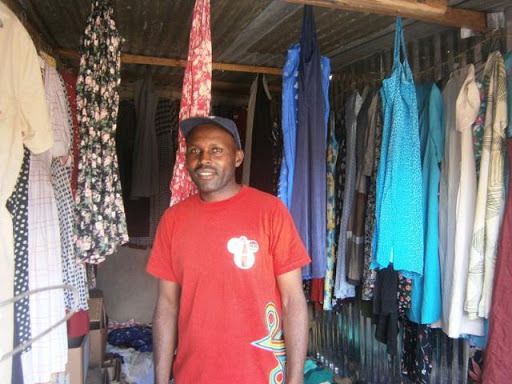 Anyway, Robert was kind enough to let me photograph him in his shop, and was selfless in giving of his time to walk me around and introduce me to many Zidisha borrowers, translating to Kikuyu, Swahili and English as needed. We also had lunch together at one point, with other Community Organizers of Karunga, where we talked, laughed, and discussed Zidisha’s impact on the community. It was agreed that Zidisha’s low-interest loans were very helpful, but that further services would be of benefit, such as medium-scale agriculture and engineering projects, to do things like aiding farmers in irrigation (I believe the region is currently mostly without irrigation). Please join me in thanking Robert for setting a great example with his use of Zidisha, as well as his tireless service of helping those around him in his community. Thank you, Robert! Best wishes and God Bless. Here is the latest update from our Client Relationship Manager in Kenya! Today I met with Josephine in Kahuo, a small village 25 kilometers north of Nakuru. Kahuo is a small agricultural village and is also Josephine’s birthplace. She now lives in Nakuru where she is a primary school teacher, teaching English, Swahili, and mathematics. However, she still is very interested in business and maintains a poultry business in Kahuo. Josephine used to raise a breed of chickens that are locally referred to as “broilers.” She found that it was too costly to maintain them and purchase the type of feeds they require. To rectify this problem, she decided to use a portion of her loan from Zidisha to invest in 150 chickens that are of a breed that is indigenous to Kenya. From the 150 chickens, Josephine was able to get around two trays of eggs per day. There are thirty eggs per tray, this is the method in which eggs are sold in the local markets here. Josephine sells each tray for 450 Kenyan Schillings. An income of 900 schillings today is very good in this region of Kenya, especially considering that Josephine is also employed as a teacher. Unfortunately, Josephine suffered a setback when nearly two thirds of her chickens died due to Newcastle disease. This is an all too common problem among poultry farms in Kenya. Josephine was able to replace the chickens she had lost and has had the new chicks vaccinated against Newcastle disease. Her business is now once again operating at its previous strength. She also occasionally sells her chickens to local butchers where she makes 800 schillings per rooster and 600 schillings per hen. In addition to purchasing chickens with her loan, Josephine also purchased four sheep. Once each sheep has given birth to a lamb, she will sell each adult sheep for a profit of 1,500 schillings per sheep. She will then raise the lambs until they older enough to give birth, and repeat the process. Finally, Josephine also maintains a one acre farm where she grows maize. This is also where her chicken and sheep are located. She employs one local farmhand to take care of the day-to-day maintenance. With her next loan, Josephine plans to invest in the expansion of her poultry and sheep business as well as her farm. An assortment of bright colors sweep the main street of Ongata Rongai, as stalls displaying neatly piled fruits and vegetables overtake the Soko Mjinga market. Mjinga, meaning fool in English, began with only ten stalls and constant ridicule and doubt from the community. But as profits were made, ten quickly grew to hundreds, and although the name stuck, many prosperous entrepreneurs can be found here. As I walk through the narrow pathways, ripe tomatoes, juicy watermelons, pungent onions, produce galore overwhelm the senses. But if you look close enough, you’ll notice something out of the ordinary; a table enveloped in school supplies and random knick-knacks. Welcome to Annah Njeri’s shop. Five years ago, Annah decided to start her own business, a business that promoted education. Having two children herself, she understood the importance of having educational tools readily available to all. Although pens and notebooks are the most frequent sellers, Annah is not short on textbooks, newly wrapped in plastic and in pristine condition. Calculators, rulers, even nail clippers, combs, and mirrors can also be found at her shop. Cleverly placed amongst the produce section, Annah has little competition and can reap the benefits of the heavy foot traffic brought on by the fruits and vegetables. I met Annah before she joined Zidisha, glad to visit her again, this time a borrower and having recently received a loan. The elation on Annah’s face is obvious, as the loan came at the exact moment she needed it. School just starting this week, parents carrying handwritten school supply lists shop for their children. Throughout my visit, I often waited happily on the side as Annah assisted her many customers. Immediately upon my arrival, she showed me two big boxes, all filled with textbooks, just purchased with her Zidisha loan. 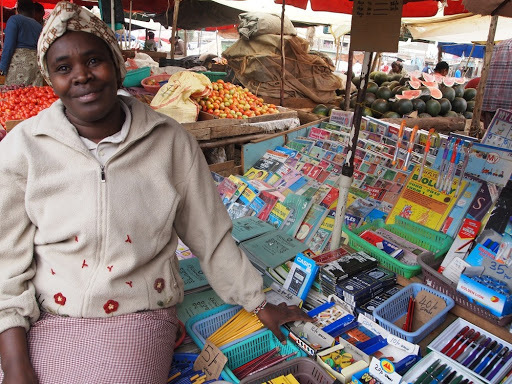 Eager to pay back early, Annah wants to take out a second loan, hoping to expand her shop beyond Soko Mjinga market. Also worth mentioning is Annah’s dedication to Zidisha, as she is now learning how to use a computer (many thanks to Zidisha borrower, Josephine Nyang’au), which will allow her to deal with Zidisha matters on her own. Hard workers are an easy find in Kenya, Annah proudly being amongst the thousands. Due to the high interest in Zidisha at Soko Mjinga market, I know I will be seeing Annah again. Annah, it was a pleasure to visit and thank you for welcoming me back. I am so happy that the Zidisha loan has helped!